The large public state universities scattered around the United States continue to provide tremendously valuable outreach services through their numerous organizational units, and more and more of them offer their services via a panoply of websites. 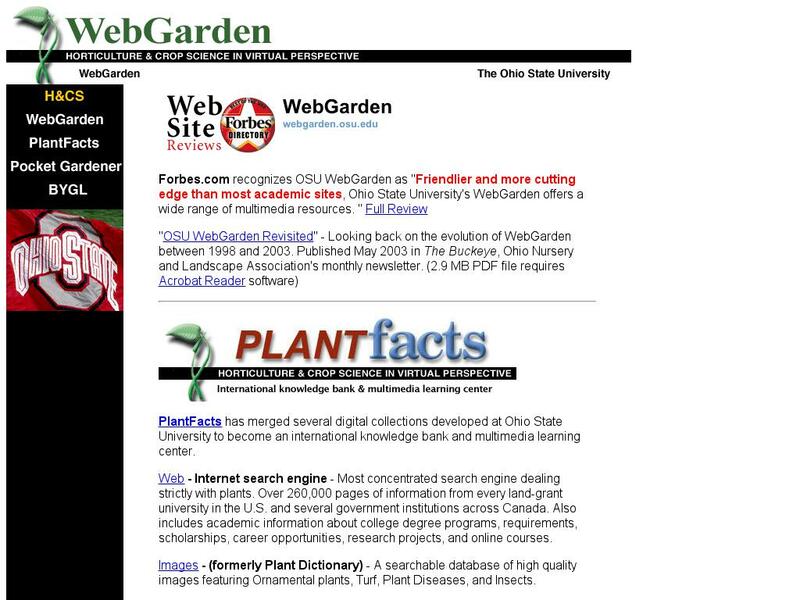 One such omnibus-style site is The Ohio State University's WebGarden. This site serves as a collection of fine online resources dedicated to providing information about the world of gardening, and about plants, more generally. The "PlantFacts" area is one worth taking a look at, as it contains several important digital collections, including an image database of high-quality plant images and a FAQ section which provides answers to over 800 gardening queries. Equally compelling is the Pocket Gardener, which is a selection of webpages that have been developed especially for both PocketPC and Palm PDA users. These web pages contain material on grasses, perennials, and vines, and five other important topics.